IDF Chief of Staff Benny Gantz on Thursday declared a change in army police whereby any firing at Israel's south will be met with an attack on Hamas, regardless of the group behind the fire. Similarly, any firing from Lebanon will result in an attack on Hezbollah, and any terror attack by Iran's emissaries overseas will prompt a response against Tehran. 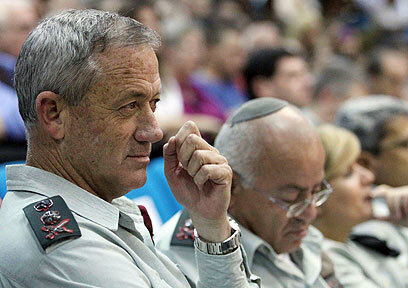 Speaking at a conference in the Gelilot base, Gantz discussed the many threats Israel faces. "The IDF is Israel's sharpened sword and protector," he noted. He also addressed the firing of rockets at Eilat on Wednesday night. It is estimated that three rockets were fired from Sinai, one of which exploded near residential buildings. The remaining two rockets have yet to be found. There were no injuries. Egyptian officials denied that the rockets had been fired from Sinai, and one security official said the Israeli reports were erroneous. Referring to last month's round of violence in the south, Gantz said: "After disrupting a lethal terror attack, we endured attacks from the Gaza Strip for which Hamas was responsible. We acted with determination and caused grave damage to the terror organization. We proved once again that we are able to protect the lives of Israeli civilians and strike those who seek to harm us with force." Gantz warned that "anyone who tries to test us, domestically or overseas, will find a sophisticated army ready to defend Israel and subdue its enemies." Alluding to recent terror attacks in India, Thailand and Georgia, the IDF chief said, "We know the source of these attacks and those behind them must know that Israel's long arm will ultimately reach anyone who seeks to harm Israeli civilians and the Jewish people, Whether in Gaza, Lebanon or anywhere else." See all talkbacks "Israel presents new deterrence policy "